Xiko fait parti du Social Media Club France, le club des pros de la communication digitale. Des échanges d’expertises entre pairs sont organisés avec des thèmes touchant le numérique. Marguerite Leenhardt est intervenue lors de la conférence sur le Social Data : où en est la méthodologie ? Xiko is part of the Social Media Club France, the club of digital communication pros. Exchanges of expertise between peers are organized with topics related to digital. 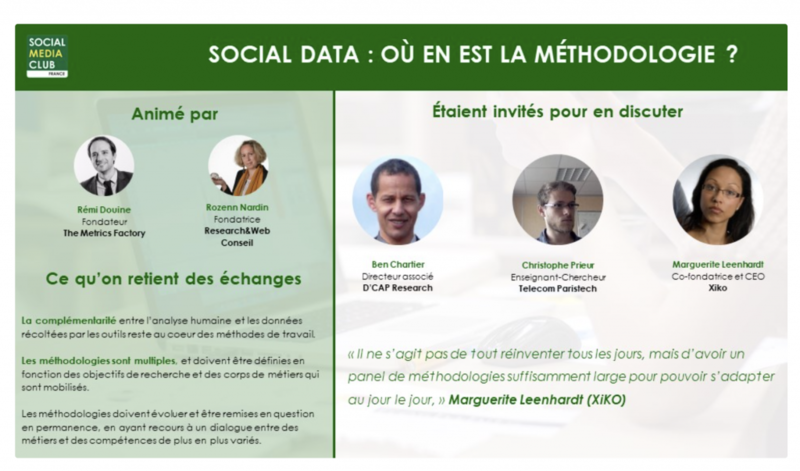 Marguerite Leenhardt spoke at the conference on Social Data: where is the methodology? The complementarity between the human analysis and the data collected by the tools remains at the heart of the working methods. The methodologies are multiple and must be defined according to the research objectives and the trades that are mobilized. The methodologies must evolve and be constantly questioned, by resorting to a dialogue between trades and skills more and more varied. To discuss this, we brought together Marguerite Leenhardt (CEO of XiKO), Ben Chartier (Partner at D’CAP Research) and Christophe Prieur (Research Professor at Telecom Paristech). This session of the Social Data Commission was led by Rémi Douine (Founder of The Metrics Factory) and Rozenn Nardin (Founder of Research & Web Conseil). “The End of Theory” provocatively titled Wired magazine in 2008 , predicting that the rise of Big Data would make scientific study methods obsolete. Ten years later, the prophecy has not yet come true. If the study of social data is needed in more and more varied sectors (commerce, marketing, advertising, journalism, science, politics) its different methods of exploitation vary, are not imposed exclusively, and still largely involve human intervention. The amount of data to decrypt, however, becomes so huge that automation is needed for those who want to study social data. Tracker, Radarly by Linkfluence … the tools available to the market are multiplying, each with their specificity, ranging from social listening to data mining. “Industrialization is essential in the method. But from the moment when we industrialize the data study, we have to delegate part of the process to machines, which implies approximations at certain times. That’s why it’s not enough to have billions of data, it takes finesse in analysis and knowledge, “says Christophe Prieur (Telecom ParisTech). If the machines in question scan the databases with algorithms, they trace elements that are then analyzed by humans. “It is essential to decorrelate the industrialization of the tool. The tool is simply an engine. If you do not know how to drive a car, the engine is useless, “summarizes Marguerite Leenhardt (XiKO). Therefore, the question of methodology remains to understand how social data is treated and analyzed, and seems as much like a problem of reading than research. We worked with XiKO to create a brand barometer of web users’ perception because this data is more and more integrated in brands marketing strategy. XiKO provided us with a detailed analysis of our clients needs and profile. The information gathered enabled us to build an effective advertising strategy and triplicate the daily number of inscriptions on our website. Thanks to their fine-grained semantic qualification, XiKO provided us with meaningful and high value-added insights and helped us achieve a better understanding of our target.